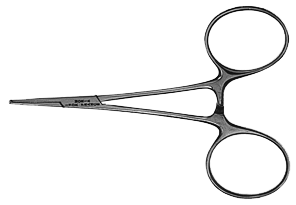 Ergonomic, curved, cystitome tips, 11.5 cm long. Fine bulbous tip, opening 27 G.
For irrigation or aspiration, opening 27 G., diameter 0.6 mm. 12 x 12 oblique teeth, for scleral fixation. With platforms and facing micro teeth 0.1 mm. 10 cm long. Bulbous tip, opening 23 G., diameter 0.6 mm. Capsule polisher, opening 27 G., diameter 0.6 mm. Upper opening aspiration 29 G., side opening irrigation. Curved, delicate, bullet shape. Ergonomic, angled, platform 11 mm, very thin. 12 cm long. For air injection, diameter 0.3 mm. Delicate, straight, usual, diameter 0.6 mm. Curved on the left, irrigation at 1 o’clock, diameter 0.5 mm. Straight, cross action, 7.5 cm long. Half curved blades and very blunt, for conjunctiva. Angled, blunt round tip. Curved, without lock, very delicate jaws 0,8 mm. Delicate, straight, with teeth. 10 cm long. 12 mm long, ended with a small ball. Angled, 0.2 mm tip. Straight, 9 cm long. Open-blades speculum, 0.8 mm wire, soft spring. Curved, blunt, blades 5 mm x 0.5 mm. Very delicate, 1 mm.